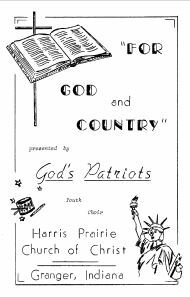 This is a tribute to the singers, sponsors, parents, chaperons and supporters of God’s Patriots at Harris Prairie Church of Christ in Granger, Indiana during 1970-1973. For three years the God’s Patriots youth choir dressed in red, white, and blue and sang for God and Country. This was possible only with God’s blessing and the incredible investment of time, talent, and determined effort by Bro. Ed Erskin, minister at Harris Prairie Church. His exceptional ability took an ordinary group of 30 Christian high school young people and developed them into the extraordinary God’s Patriots youth choir that sang for the glory of God. This is how it happened! How God blessed and used the efforts of thirty teen-agers, a few patient adults, and one determined, piano-playing preacher to witness for God and country from Joplin, Missouri to Washington, D.C. 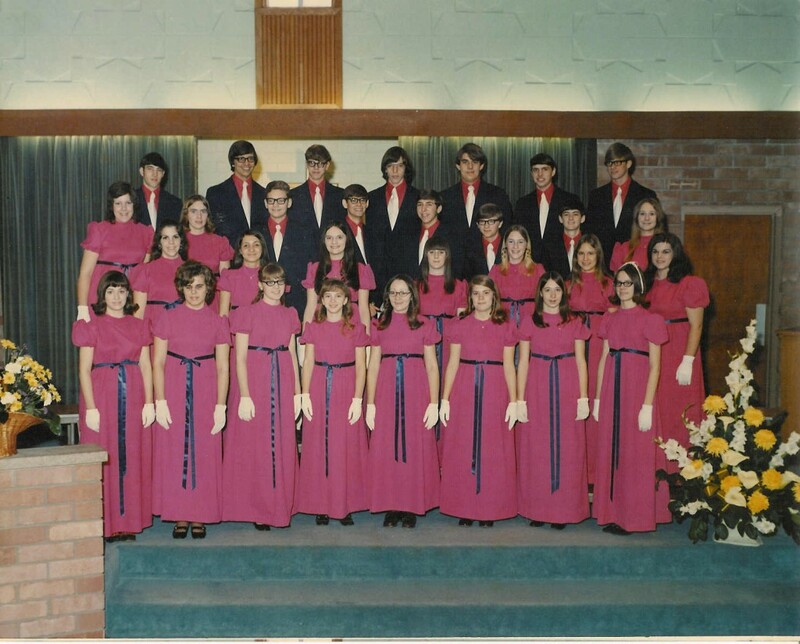 Thinking back, there was a time when the Harris Prairie Church of Christ, Granger, Indiana, didn’t have a youth choir. Now, our people have become so involved with them, it’s hard to remember when we didn’t have God’s Patriots and our junior choir, His Seekers. The genesis of the patriotic theme was 1967. Faced with the trend toward cynicism and disrespect for our nation’s flag, ideals, and heritage, we decided to include patriotism as an aspect of Christianity during the Vacation Bible School closing program. Parents and students were equally enthusiastic, for even our younger parents were reared in an atmosphere of respect for American fundamental principles. All of us wanted our children to experience the stirring emotions we knew and to develop into responsible citizens of this great nation. During the next few seasons a girls chorus developed into a real fellowship group under the sweet spirit of the late Mrs. Leah Reynolds. Then Edgar Erskin, our minister, worked in some young men for the Christmas program, and by the next Easter sunrise service we had a mixed chorus going. The youth had a good sound and were very enthusiastic about singing together. On August 15, 1970, the first practice was held for a group that soon would be known as God’s Patriots. Hard work was the order of the day, because their first concert was set for the end of September. Being blessed with some high-school choir members and Mr. Erskin’s talent for getting a group to blend and produce more than they thought they could, they were an immediate success. We expected a good program that night, but what we heard was a great concert. The excitement and pride they projected in the patriotic selections and the tenderness of “The Lord’s My Shepherd” were blessings to people who were weary of protests, the desecration of national shrines, and the philosophy of no meaning and no purpose. From that first concert the real impact of this group has been something meaningful. One of the boys said in the introduction to “America, Our Heritage,” “We should not overlook the faults of our country, neither should we be blind to her greatness.” When God’s Patriots started out perhaps they hadn’t thought too much about this great land of ours, perhaps many of them were not really experiencing the presence of Christ in their lives, but as a result of their working together and sharing their needs and joys each one began to grow, and to project his convictions to the audiences. By spring, two big events were in the making. 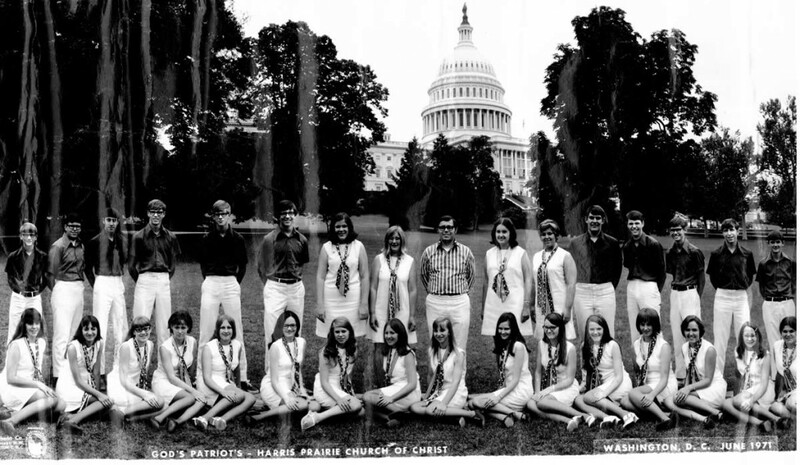 They had been invited to sing on the program of Deeper Life Week at Ozark Bible College and there was a stirring of desire to make a trip to Washington, D.C. when school was out. 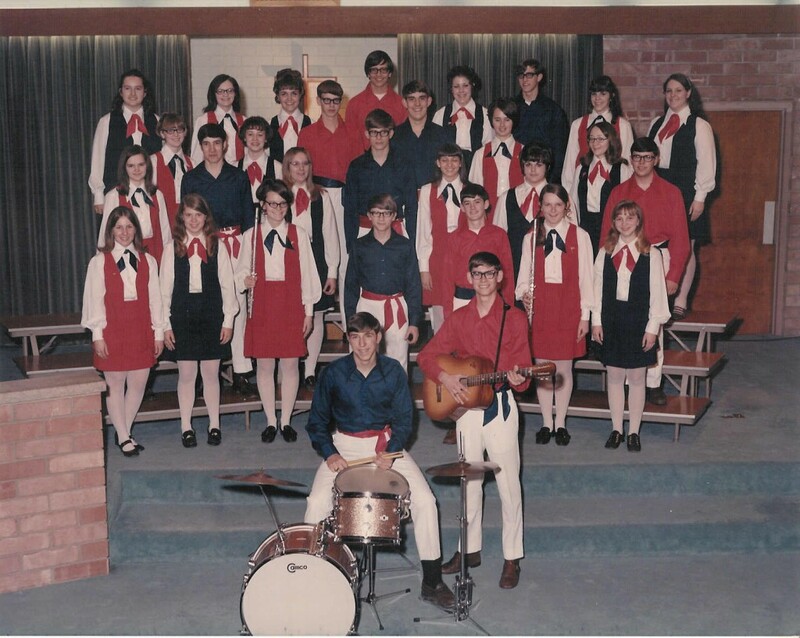 Since the fall of 1970, God’s Patriots had been exposed to the Impact Brass and Singers and Concert Choir of Ozark Bible College, and the spirit of commitment and sharing of these college young people had really rubbed off on our kids. If there is any doubt about your having college groups come and stay in your homes, that doubt would be dispelled after seeing the impact of our youth. There was no stopping them now! They undertook with a vengeance to raise funds for the first trip by making themselves available for spring cleaning work, washing cars in that cold March weather, and praying a lot. What a thrilling spiritual experience it was for this group of high-school youth to step onto the platform of the chapel of Ozark Bible College and sing before a capacity crowd of more than twelve hundred. They sang and smiled as tears glistened on their faces. When they came to the conclusion of their concert, the audience gave them a standing ovation. This was wonderful for them, but the highlight of that April was the marvelous spirit they came home to share with us. Their faith strengthened, they were no longer timid about witnessing, and they saw the matter of saving souls as the greatest goal for their group. We all know that nothing succeeds like success, so it was back to the rakes, mops, and concerts and prayers for the second trip. For a time it seemed doubtful that they could ever reach such a goal. Arrangements were made for them to stay in the dorms of Eastern Christian College, Bel Air, Maryland, a bus was chartered, and God provided the necessary funds. One important preparation these young men and women were making was a concentrated prayer effort for real harmony of personalities on the trip. There would be thirty-nine people, eight of them adults, living together for a week. God honored those prayers and gave them a perfect trip. The second week of June found them rolling eastward, a mountain of clothing and equipment stashed away. The Patriots were thrilled with the prospects of witnessing for their Lord in our nation’s capital. The Department of the Interior had invited God’s Patriots to sing a noontime concert on Tuesday at Rawlins Square in the heart of Washington. They started singing in a drizzle of rain with few spectators, but finished with the park full of people. One sponsor heard a comment about how great is was to see young people praising God and their country instead of denying God and trying to tear the country down. God’s Patriots from Harris Prairie found Washington to be warm and friendly. Whenever they had an opportunity they sang and people would gather to listen. But what was most gratifying was to see those young people go into the crowd, shaking hands and telling how thrilled they were to be Americans and how wonderful is Jesus Christ. It was super! Another highlight of their visit in the Washington area was further fellowship with the Impact Brass and Singers of Ozark. God’s Patriots considered it a real honor to be asked to share a program with them at the Manor Woods Church of Christ in Rockville, Maryland. With reverence the youth viewed the Constitution and Declaration of Independence in the National Archives. Singing on the steps of the Lincoln Memorial and visiting the Arlington National Cemetery had a profound effect on them all. “I am thankful to God for allowing me to be an American,” words from one of their numbers, took on a deeper meaning. Surely the Lord has blessed these young people. They probably don’t realize completely that the opportunities they have had to witness through music will be among the most memorable years of their lives. Much prayer, much patience, and most of all much love goes into a venture such as the one in which Mr. Erskin has led them. There were several more concerts before the graduates went off to college, and the last one was hard for them. This would be the last time this particular group would sing together. They were so very close, brother and sisters in Christ. The experiences they had been fortunate enough to share were over, but would never be forgotten. But, God’s Patriots continue. New boys and girls came into the group which now numbers thirty-six. And they, too, are on the move. They were invited to sing during the Thursday evening youth session of the North American Christian Convention in Cincinnati. God’s Patriots are not perfect young people, but they do love Jesus and they seek to serve Him. They have the same kind of hang-ups most young folk have today. The fellows are interested in cars and getting jobs, the girls are interested in the boys and clothes. They have the same temptations at school, at work, with friends that all teens have, but they are aware that they have Someone to see them through each trial. Yes, they are just plain kids, growing up in a sin-sick world, but they are going to come through with flying colors because the Savior has become real to them. They have become aware of the blessings of living in a free land, especially the blessing of freedom to worship without fear. This year three members of the choir are going to Bible colleges, and at present four from last year’s group are already there. As the years go by and we see these teens become adults, we are assured of the merit of such an undertaking. They have a profound respect for our nation, and have come to know Jesus in a deeply personal way. We are convinced they will continue to “Pass It On” wherever they may go. You have done a wonderful job putting this page together Bob, and listening to the songs and looking at the pictures of the group has brought back SO many good memories of our times together doing such a wonderful thing that affected so many people, and us too of course. It’s interesting that after so many years that line is still so appropriate in the article that my mom and Dorothy wrote: “We should not overlook the faults of our country, neither should we be blind to her greatness.” I’m sad that so many of our parents have passed as well as a few of our members, but I’m so glad to still have such a great relationship with this bunch, no matter where in the world they are. The Christian tie does bind us together nicely. This is a great presentation. It brings back lots of memories for me as I have sung in so many such ensembles. I know how powerful and beautiful it has been for you. I loved all the numbers. Well done, Bob. This certainly brings back a lot of beautiful memories – all the kids we grew up with – the times we shared as a church family. Thank you for taking the time to do this! I turned on the first song and just started crying. Even though I was too young for the choir, with mom and dad being chaperones on the trips I was lucky enough to travel with. Brings back so many fun memories. I wish Greg were here to listen and sing along. I can’t wait to show this to mom and dad. Great article! Brings back lots of memories! WOW, Love love the site. A big Thank You to everyone involved for doing a Fantastic job of putting this website together! Sitting here listening, reading & watching videos with tears and smiles at the same time. So so many great special memories and Ed has such a special God Given talent with music & playing that Piano! God Bless Everyone involved in any way with God’s Patriots. Being a small part of this group was a very Rewarding, Fun, Exciting, Special and Blessed experince in my Life! Thank You All! We were very blest to have lived during those special times. Bob thank you for the wonderful memories. God had his hand in bringing us all together. The impact of this brought me back to simple reality. Thank you for the awesome job in sharing this with us. It seems over the years when I have seen some of you not a day has passed. Following reading and listening to the website I jumped in my car to head to a meeting and attempted to sing pass it on to myself. I couldn’t get more than the first few words out as it struck me with such emotional impact. What great memories and I am encouraged by the thought of reuniting with you all. Thanks again Bob for continuing to Pass it on!! What a great job, Bob. Listening to the songs, reading the text, so many tears, emotions, and memories. Many, many times over the last 42 years I’ve talked about the “youth choir”. It was such a great experience for all of us and sad that you don’t hear more about things like this in present day. Thank you all for putting this site and the “reunion” together. I’ve been blessed for being part of God’s Patriots! I want to thank you Bob for putting this together! Yes it does bring back a lot good blessed times. With Tim and I looking for choir members I got a little too busy, and didn’t spend the time I should have reading and listening to the words of these songs! Today I have read it again and listened. There was a time in my life that these (tapes) were played over and over to me. This group and these songs will always mean the world to me. Hearing this brings tears of joy to me and always will! I am hoping to see some of you over the Labor Day weekend, We will be blessed, thank you Brother Ed, for all of your time and talent, you are a blessing to all of us!!! Thank you for sharing – this brings back so many memories. Just listened to these songs again Bob. With Brother Ed about to go to heaven they are even more meaningful to me. Thank you again for doing this fabulous website on God’s Patriots.